Can Paracord Really Be Used for Climbing and Rappelling? You've probably heard that paracord can do it all. Enthusiasts say it can be used for: making a hunting bow, rock climbing, emergency sutures, tent lines, hammock suspension, tourniquets, you name it! But can paracord really be used for all these things? Isn't some of that a little far-fetched? Let's delve deeper into the uses of paracord. We will periodically be coming out with articles such as these that fact-check people's claims about the many uses of paracord. 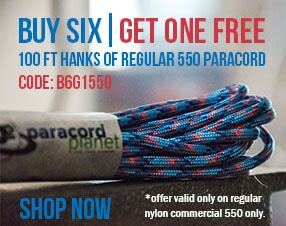 It should be understood that by "paracord" we usually mean paracord with a 550 lb. weight rating. We will, however, introduce you some alternatives. While paracord is an extremely useful and versatile tool, it does have its limitations, and we're going to find them! Question: Can Paracord Really be Used for Climbing and Rappelling? Some see the 550 lb. rating on standard paracord and think that because they, the climber, weigh less than 550 lbs, they can use paracord as a climbing rope. The truth is: a falling person weights a whole lot more than a person standing on the ground. The recommended strength rating for a climbing rope is 10 to 15 times the weight of the climber. This means that 550 paracord falls far short of the requirements of a good climbing rope. Climbing ropes should have less than 12% elongation. Paracord is required to have at least 30%. This feature is useful in many circumstances, but not in fall protection for climbing. A rope with a high level of stretch will cause the climber to fall farther before the rope stops the fall. While paracord's thin diameter makes it very lightweight and easy to store, this also makes paracord easy to cut. Think about it: a paracord lifeline could be cut with one slash from a very small knife, or one rub against a slightly sharp rock. In the instance of rappelling, where a lot of friction is involved, paracord can be easily cut by another strand of paracord! Having both hands free is obviously important while rock climbing. Unless you want to climb with your pirate sword in your mouth, you need a way to attach it to your person. Here is where paracord proves invaluable. Use short lengths of it to tie on your chalk bag or even your video camera. A climber can ascend a toprope with the help of paracord prusiks. However the climber should also be tied into the climbing rope for extra fall protection. Here's a decent demo of how that works. Some advanced rappellers have opted to leave no trace in order to preserve the landscape and allow others to have a "first descent" experience. There are many different devices and knots used for these techniques that involve a length of utility cord or paracord for pulling-the-plug, sometimes literally, on their climbing/rappelling anchor. While, yes, you technically can rappel using paracord, it should only be done in cases where you will die if you stay where you are. Rappelling with paracord is extremely dangerous. This is not the kind of danger that you can completely negate by being extra careful. That being said, there are skills you can learn to make survival more likely. If you are planning supplies for a mountainous hiking trip, it may be a good idea to pack mil-spec #750 paracord instead of the standard #550, just in case. 550 paracord should never be used as a fall protection rope when climbing. It simply will not protect you from a fall. 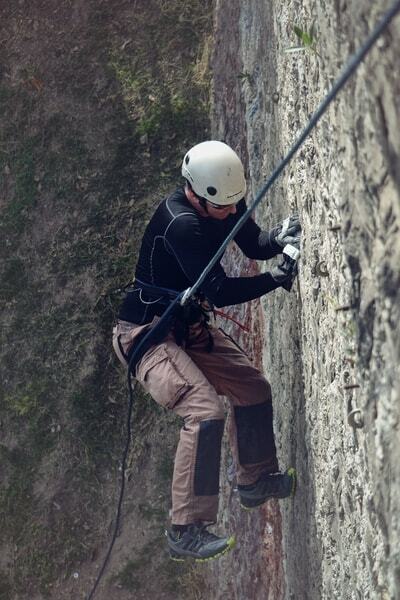 550 paracord can be used to aid in climbing by performing a variety of tasks. If left with absolutely no other option, 550 paracord (doubled up) can serve as an emergency only rappelling rope that will likely get you to safety if proper caution and technique is used. Are you a rock climber? 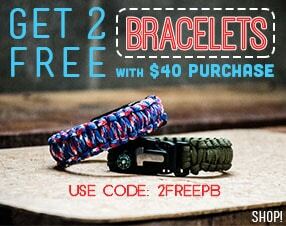 What other uses of paracord do you feel are questionable? Let us know in the comments for a chance to win 100 ft. of #550 paracord. Last week Andrew and Isabel commented and won a hank of #275 paracord!